In this verse, we can see that those who never accept others’ advice but place too much trust in themselves are arrogant and foolish. Those who modestly listen to other opinions are people who have true wisdom. Such people are rational and not self-righteous, and easily accept the truth. They are pleasing to God. Just imagine Dada had let go of herself and carefully considered Benben’s advice, could she have avoided the tragedy? The Bible said, “Proud and haughty scorner is his name, who deals in proud wrath” (Proverbs 21:24). Proud and arrogance make one foolish and extraordinarily self-right. In the face of other opinions, such people never consider whether others’ advice is reasonable but directly refuse it. Or even though they know what others put forward is correct, they don’t accept the advice because they cannot let go of their arrogance and vanity, but think it debases themselves. Driven by this arrogant disposition, we are self-important and self-conceited, always insist on ourselves and deny others and cannot accept others’ advice, and thus we will be the ones who suffer loss in the end. In fact, man can’t be perfect. One’s ability is limited however high it is, and one’s knowledge is limited however profound it is. We can do a better job only when we are able to listen to proper suggestions and learn from others’ strong points to offset our own weaknesses. Jesus once said, “For whoever exalts himself shall be abased; and he that humbles himself shall be exalted” (Luke 14:11). The verse tells us that God loves those who can humble themselves. God says, “What is vital now for you all to do is to learn to obey that which is right and to obey that which comes from the truth and that which conforms to the truth; in this way, you are walking and practicing toward being obedient to God. … Through obeying, seeking, praying more, retreating to your spirit and coming before God then, unbeknownst to you, a change will happen in your inner condition.” Only those who can obey God and obey that which is right are the wisest and most sensible. So, we should try to let go of ourselves and learn to listen to other opinions. If you practice this way, you will gain something different. Testify God wishes you and your family and friends a happy life! 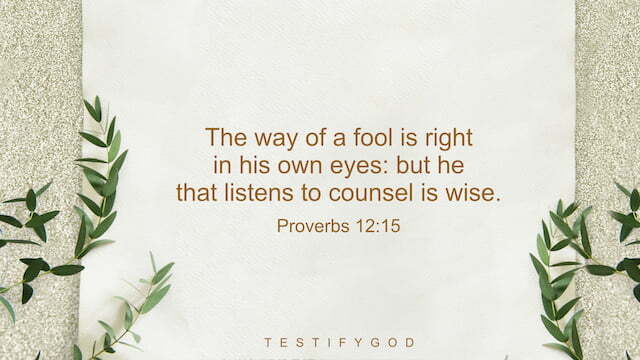 Proverbs 14:8 “The wisdom of the prudent is to understand his way: but the folly of fools is deceit.” Reflection This verse tells us that those who are wise and intelligent clearly know their way. They set direction and goal ahead rather than move on blindly. Therefore, they clearly know what they want, and their choices on life path are wiser than others. They are not subject to the impact of any people, events, or things. Take Peter as an example. He was agile of wit, endowed with native intelligence, and should have become somebody after growing up. However, he was determined to believe in and follow God, and sought to know God and love God while following Him, and ultimately achieved the supreme love of God and was perfected by God. Those who are foolish are different. They are suspicious of and guard against God at every turn. No matter what they do, they rely on their imaginations and sight. They don’t believe anything that is invisible to man. When they believe in God, they hold something back for themselves. They have doubts about God’s words, God’s promise, and are even ambiguous about His existence. The path they walk is that they pursue money, fame, and fortune while believing in God. Only when God appears publicly or the great disaster comes one day will they wholeheartedly seek the truth. This is the path the fools have chosen. Just like Thomas. Although he followed the Lord, he did not believe in the Lord’ words, nor did he believe that the Lord would be resurrected after three days. Thomas didn’t believe until he saw the scars from the nails on Jesus’ hands and touched His rib. Such kind of man is foolish and cunning. So the Lord Jesus said to him, “Thomas, because you have seen me, you have believed: blessed are they that have not seen, and yet have believed” (John 20:29). It can be seen that it’s very important to take the right path in our belief in God. Most importantly, we should have a proper pursuit as we walk our road ahead. If we can, like Peter, wholeheartedly love God without deals and demands, or speculation and doubts, and all of our actions are for loving and satisfying God, then we will be people who are prudent and wise, and approved by God. » Most people also watch Christian Movie: “Deadly Ignorance”: Who Should We Listen to in Welcoming the Lord’s Return Peace be with you all! Dear brothers and sisters, if you have any understanding or enlightenment from God, you’re welcome to share with us.1. Via the online chat window at the bottom right corner of the screen.2. Send an email to info@testifygod.org.We sincerely hope we’ll grow spiritually through sharing with each other. Proverbs 13:3 “He that keeps his mouth keeps his life: but he that opens wide his lips shall have destruction.” Reflection We have been corrupted by Satan right up until today and are full of corrupt satanic dispositions. Especially arrogant, they have a big mouth and arbitrarily judge others. Just when Jesus was preaching, the chief priests, scribes and Pharisees judged, even blasphemed the Lord because the words and work of Jesus were incompatible with the conceptions of them. What they had done finally provoked the disposition of God and were punished. They suffered from the agony of losing their own country. God’s words say, “You must know that you are arrogant and haughty by nature, and unwilling to submit to the fact. Therefore, I shall tell you little by little after you have reflected upon yourselves. I exhort you to better understand the content of the administrative decrees and know the disposition of God. Otherwise, you will find it difficult to keep your lips sealed and your tongues from wagging too freely with high-sounding talk. Unknowingly you may offend the disposition of God and fall into the darkness, losing the presence of the Holy Spirit and the light. For you are unprincipled in your actions. If you do or say that which you should not, then you shall receive a fitting retribution.” His words urge us to seek the principles when do anything. Don’t talk nonsense which you should not. Guard our own tongue and seek more, we will not commit sins. » Read more in these articles: • Beware of the Pharisees’ Leaven on the Path to the Heavenly Kingdom • Gospel Reflection: Why the Pharisees Could Not Recognize the Lord Jesus Was the Messiah • How to Be Humble? Peace be with you all! Dear brothers and sisters, if you have any understanding or enlightenment from God, you’re welcome to share with us.1. Via the online chat window at the bottom right corner of the screen.2. Send an email to info@testifygod.org.We sincerely hope we’ll grow spiritually through sharing with each other. Proverbs 12:22 “Lying lips are abomination to the LORD: but they that deal truly are his delight. ” Reflection This verse tells us that God loathes those who are deceitful and loves those who are honest in their words and actions. God demands man to be honest because God is faithful. Jesus also said, “Truly I say to you, Except you be converted, and become as little children, you shall not enter into the kingdom of heaven” (Mat 18:3). Then, what we should do to be honest persons? First, speak the words of our hearts when we pray to God. We can speak honestly to God according to our difficulties or our sufferings. When we pray to God with a true heart, He will enlighten us. However, if we just say something pleasant to achieve our aims in prayers, then such prayers are deceiving God. Jesus teaches us: “But let your communication be, Yes, yes; No, no: for whatever is more than these comes of evil” (Mat 5:37). So, we need to be honest when we pray. Second, no lies in speech or deceit in the heart when we interact with others. In our real lives, we have to interact with others. During this process, if we tell lies to others just for our interests, then we are not honest persons. When we realize that we have done something wrong, we need to bravely admit our mistakes to achieve true repentance and change. Don’t talk the talk but walk the walk. Share a passage of God’s words: “When you give your heart to God alone and you don’t play false to Him, when you never do what would deceive those above you or below, when you’re open with God in all things, when you don’t do things simply to win the favor and smile of God, this is being honest. Honesty means when you run from impurity in each word and each deed, when you cheat not God nor people. Honesty means when you ran from impurity in each word and each deed, when you cheat not God nor people. This is honesty, oh, this is honesty. If your words are filled with excuses, filled with vain explanations, then you are not practicing the truth, you’re not willing to do so. …” » Read more on our Honest person page, or click on the related articles below: • How to Stop Lying? Know Why We Lie • Applying for Jobs Honestly, I’ve Seen God’s Blessings • Christian Testimony: A Day to Be Honest Peace be with you all! Dear brothers and sisters, if you have any understanding or enlightenment from God, you’re welcome to share with us.1. Via the online chat window at the bottom right corner of the screen.2. Send an email to info@testifygod.org.We sincerely hope we’ll grow spiritually through sharing with each other. Proverbs 13:6 “Righteousness keeps him that is upright in the way: but wickedness overthrows the sinner.” Reflection This verse teaches us to be righteous and honest people. Because God likes this kind of people. Just like God says: “You ought to know that God likes an honest man. God has the substance of faithfulness, and so His word can always be trusted. Furthermore, His actions are faultless and unquestionable. This is why God likes those who are absolutely honest with Him.” “Honesty means to give your heart to God; never to play Him false in anything; to be open with Him in all things, never hiding the truth; never to do that which deceives those above and deludes those below; and never to do that which merely ingratiates yourself with God. In short, to be honest is to refrain from impurity in your actions and words, and to deceive neither God nor man.” From God’s word, we can see the reason why the righteous and honest people could be able to gain God’s approval. And also, we found the way to become an honest person. Only those who are righteous and honest can satisfy God’s will. Such people would never be able to resist or betray God, but be of one heart and mind toward God. Such people will surely be cared and protected by God. The latter half of the verse warns us Christians that if we sin, we will be trapped in wickedness. We were corrupted by Satan, having the sinful nature, and Satan is ceaselessly tempting us to sin, to betray God. If we always commit sins and are not able to truly repent, we are always living under Satan’s domain. Over time, we will be eaten up by Satan. Therefore, being a righteous and honest person should be the goal that every Christian must pursue. » Most people also watch Christian Movie: “The People of the Heavenly Kingdom” | Only the Honest Can Enter the Kingdom of God Peace be with you all! Dear brothers and sisters, if you have any understanding or enlightenment from God, you’re welcome to share with us.1. Via the online chat window at the bottom right corner of the screen.2. Send an email to info@testifygod.org.We sincerely hope we’ll grow spiritually through sharing with each other.